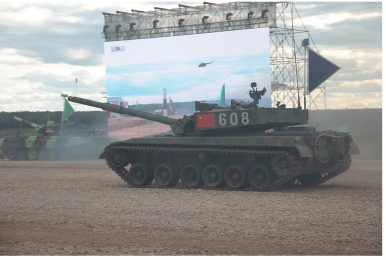 The Chinese ZTZ-96A main battle tank in action. Chinese soldiers, however, won gold medals in two individual championships. In total, around 2,000 military personnel divided up into 57 teams from 17 countries including Angola, Venezuela, Kuwait, Kyrgyzstan, Mongolia, Nicaragua, India, Armenia, Kazakhstan, and Tajikistan, participated in 13 field, air, and sea training competitions. The teams from Belarus, China, and Russia had the most members. According to China Military Online, the People’s Liberation Army (PLA) team won two gold medals in the “Safe Environment” and “Masters of Reconnaissance” competitions. The head of the Chinese delegation told China Military Online that the competition will inform the ongoing combat training reforms within the PLA. Russia’s first deputy defense minister, Arkady Bakhin, said that next year’s competition will have a “global reach.” “I wish success in future to the teams and to prepare for the ArMI-2016 and to show their skills, professionalism and the best qualities,” he added. The event attracted around 250,000 spectators. According to the Russian Ministry of Defense, more than 13 million viewers followed the games via the ministry’s website. The ‘World Championship Tank Biathlon 2015’ will kick off on August 1 near Moscow.